The premier concert series “Cool Thursdays” at the Dallas Arboretum, sponsored by Wells Fargo Bank, presents The Dallas Winds, a patriotic tribute to America, on July 2 as the series’ final concert for the summer. As Dallas‘ only concert series overlooking the picturesque White Rock Lake on the award-winning Martin Rutchik Concert Stage & Lawn, the weather is perfect to enjoy this outdoor performance and beautiful sunset. Tickets are still available for purchase online. The Dallas Winds are the leading professional civilian wind band in the United States today. Comprised of 50 woodwind, brass and percussion players, the band performs an eclectic blend of musical styles ranging from Bach to Bernstein and Sousa to Strauss. 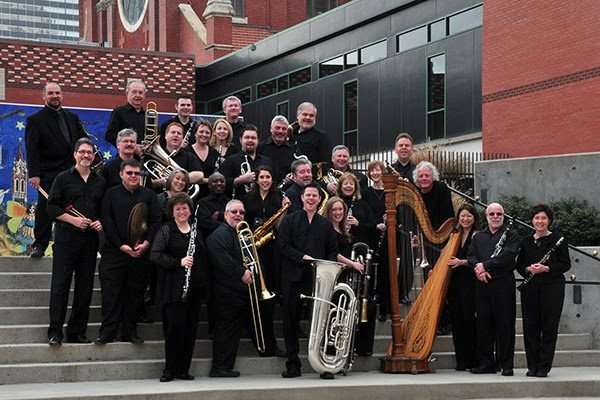 They combine the tradition of the British brass band with the musical heritage of the American town band and the pioneering spirit of the 20th century wind ensemble. Housed in Dallas’ Morton H. Meyerson Concert Center, The Dallas Winds are one of only a handful of professional windbands left in the U.S. Since their debut in 1985, The Dallas Winds have entertained more than a million people both at home and increasingly, on tour. Among those entertained was Her Majesty Queen Elizabeth II, for whom the The Dallas Winds gave a command performance in March 1991. In addition to the coolest view of White Rock Lake, attendees can bring picnics and beverages or purchase food from food trucks including The Guava Tree, Cajun Tailgators and Bobaddiction. The gardens are also open to stroll through before the concert to enjoy the Summer at the Arboretum display and the various gardens. The Cool Thursdays Concert Series begins again in the fall on September 3 with China Grove, the Doobie Brothers All Star Tribute Band. To continue the celebration of America’s independence in true red, white and blue style, the Dallas Arboretum will offer active and retired members of the armed services free admission and all other guests a reduced $5 admission on Friday, Saturday, Sundayand Monday, July 3-6. Guests will enjoy patriotic music and flags throughout the garden. In addition, the Rory Meyers Children’s Adventure Garden will feature festive, interactive activities for children all weekend. Some activities include the Patriotic Scavenger Hunt, A Star Spangled Galaxy OmniGlobe Presentation, The Stars and Stripes Craft Corner and Red, White and Fruit in the Incredible Edible Garden. Admission to the Children’s Adventure Garden is an additional $3. To see a full list of all Fourth of July activities going on in the Children’s Adventure Garden, go to www.dallasarboretum.org. The Dallas Arboretum and Botanical Garden is located on the southeastern shore of White Rock Lake at 8525 Garland Road, Dallas, Texas 75218. The Dallas Arboretum is also the home of the internationally acclaimed Rory Meyers Children’s Adventure Garden. The Arboretum is open daily from 9 a.m.-5 p.m.General admission is $15 for adults, $12 for seniors 65 and older, $10 for children 3-12 and free for Arboretum members and children two and under. There is an additional cost of $3 per person for entrance into the Rory Meyers Children’s Adventure Garden. On-site parking is $15; pre-purchased online parking is $8. The Dallas Morning News is the principal partner of the Dallas Arboretum. The Arboretum is supported, in part, by funds from the Dallas Park and Recreation Department. WFAA is an official media sponsor for the Dallas Arboretum. For more information, call 214.515.6500 or visitwww.dallasarboretum.org.